A Day in the Life of the Bowers': Ugh!! So, we got home from Florida yesterday around 10 pm. 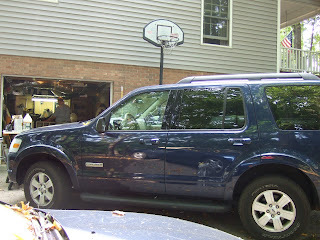 When we got there, Mike opened the garage door and got out. I was still in the car and we both started smelling this awful smell! It smelled like something had died outside. 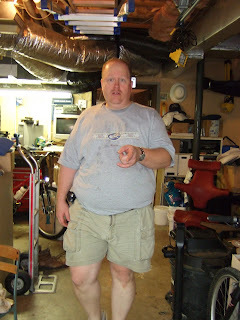 As we walked through the garage, it started smelling stronger, and as we entered the basement, it was even worse! We thought that something had surely died there and was possibly in the wall. We couldn't really tell where it was coming from, but the whole basement smelled terrible! It even started to smell on the main level. Well, after a little investigating, Mike discovered that it was our freezer....our practically brand-new, just-OVER-a-year-old freezer. It had stopped working. It was running, just not cooling. We realized that we hadn't opened it in at least 2 weeks and had been smelling something for at least that long, but very faintly. (We thought it might be the kitty litter box, even though Mike cleaned it out several times.) So, Mike emptied the freezer and got it out of the house. By then, the smell had wafted throughout the entire house, and what's worse? We had a huge, I mean huge (like 25 lbs) bag of coffee beans in there. The coffee seems to be ok, but the smell throughout the house is like rotted coffee! So while we were at the grocery store today and passed by the coffee aisle, I thought I was going to be sick from the smell! 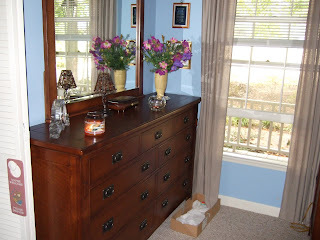 And, you may notice in some of these pictures that our windows are open to air out the house even though it's 86* outside. That's actually pretty good because while we were in Florida it was 104* here! 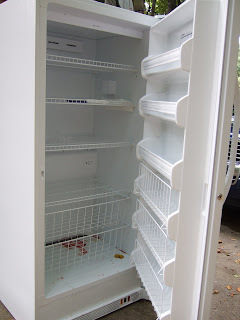 So, what do you do with a freezer that's not working and is just out of the year warranty? Any suggestions? We haven't checked to see how much it will cost to get it fixed. Surely that will be cheaper than buying another one! 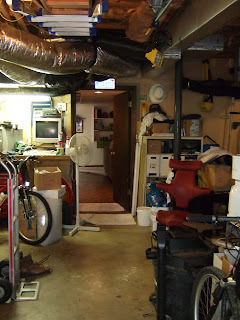 Here we have the basement door open with a fan blowing out trying to air it out. We also lit candles all over to help cover up the smell. 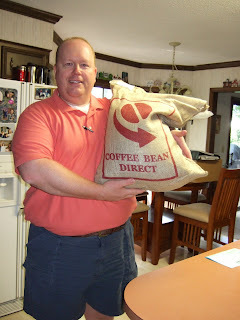 Here is our bag of coffee when we got it just a month ago. Yeah, we're afraid that we won't be able to use it anymore. It smells SO terrible! 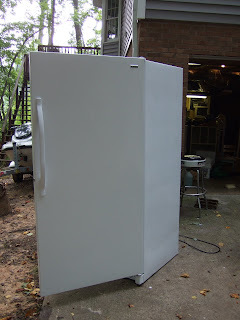 The refrigerator my parents bought when they were first married lasted them for nearly 50 years. They JUST DON'T MAKE 'EM LIKE THEY USED TO!!! NOW I'm back in school, Kim. Went in at 7:30 this morning and didn't head home til 8:30 this evening. Yep - - - BACK IN THE SADDLE AGAIN!!! no one needs that much coffee! Normally I'd agree with the coffee comment, but I've been on auto-pilot for 2 months now. Coffee and Coke Zero are keeping me alive. Next time you buy a 100-lb bag of coffee, let me know. I'll split it with you. We've been ordering coffee beans online for a while now - 5 lbs at a time. We were saving money by buying 25 lbs. However, we've only had it a month, hardly used any of it, and had to give it away because we have that rotten smell stuck in our heads. Everyone else says it smells fine, but we sure can't drink it! Wow! Sorry about your freezer. I'm so paranoid to leave our house when we go on vacation. When we lived in Marion, we had our air conditioner go out while we were on vacation. I don't know how hot it was because our thermostat was pegged at the top, but our candles melted, if that gives you any idea. Another time we had an animal die under our house when we were on vacation. That's a smell it took a long time to get rid of. We hire a housesitter now.